Romeo Juliet quotes--what does this all mean? Let me try to unravel some of the mystery of Romeo & Juliet by sharing with you some memorable quotes from the story. The experts tell us that Shakespeare wrote Romeo and Juliet early in his career sometime in the early to mid 1590’s. It is a tragic romance of two young lovers, from feuding families, whose untimely and tragic deaths ultimately unite their families. 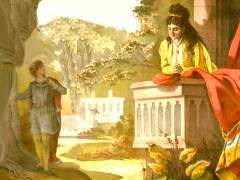 The story of Romeo and Juliet has produced some of the world’s most memorable quotes. I am giving you only a few of the many Romeo Juliet quotes from this play. I hope you enjoy these Romeo Juliet quotes, and if you haven’t done it already-- go get a copy of the play & share it with a friend. Sit back at home with a warm cup of tea, or a glass of wine and travel back in time as you read one of the most famous love stories of all time—Romeo & Juliet. But until then let me share a few interesting Romeo Juliet quotes from the story. Doth with their death bury their parents’ strife. . . .
O, I am fortune’s fool! . . .
Then I defy you, stars. "See, how she leans her cheek upon her hand! that I might touch that cheek!" Shakespeare was truly a master at painting a beautiful image with words. I thought that you would enjoy the above quotes more if you could see them within the context of the words that accompany them. J Maybe Juliet is sighing about the shoes?? That I reviv'd, and was an emperor. The sun for sorrow will not show his head. Love Songs For Love Birds-just click -listen-buy.